The holiday season is many of our client’s most prime times of the year for sales. For this reason, it is of uttermost importance that their websites are primed and ready for the rush of holiday traffic. Here are 8 steps you can take to ensure a healthy website that is optimized to climb the rankings before the busy season gets underway. To ensure the best searchability and rankability of your website, it’s smart to start with the foundation of a healthy website. To do this, run a “site audit” to help surface any technical issues that could be hindering your SEO efforts. There are plenty of tools that help you analyze your website’s health, such as WooRank, SEMrush, and Google Search Console. There are quite a few errors to look out for, but below are the most common quick fixes. Broken Images: Broken images not only make your site look unprofessional but they also negatively affect your SEO efforts. Make sure images are properly hosted and embedded to improve your user experience. Broken Links: Broken links lead users to non-existent web pages, thus negatively affecting user experience and search engine crawlability. Make sure all the links on your website lead to an active page that is relevant to the copy and the user. 401 Errors: A 401 error means that a webpage does not exist thus cannot be accessed. This can sometimes just be a result of a broken link, but it can also be from an old page that no longer exists. If a web page returns an error, remove the link to the error page or replace it with another URL. With the holiday season comes a lot of holiday shoppers. With the heavier load of traffic, it is important that your website loads quickly. Just a few seconds too long and your visitors might click out to visit another, faster, website. There are multiple free tools that measure how fast your site loads. 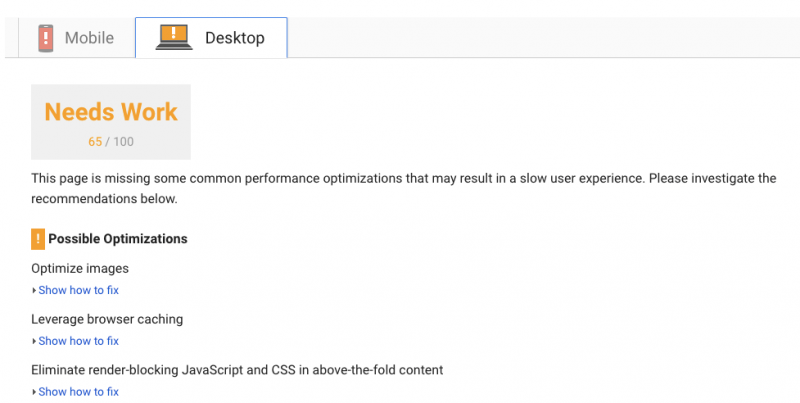 I prefer Web Page Test because of the detailed information it provides, but Google’s PageSpeed tool should be used in conjunction. Some steps require technical expertise, but others do not. Cloudflare: Using a content delivery network, such as Cloudflare, can speed up the performance of your website. Cloudflare will act as a “filter” for all of the traffic to your site. Its collective knowledge of millions of other websites will block the bad traffic and send you only humans. Cloudflare will also cache your pages so that they load quicker and require fewer resources. Optimize Images: If you have huge files on your website, it is suggested that you optimize the images by decreasing their file size. You can compress your images using tools like TinyPNG, which can reduce image sizes up to 80%, without affecting the quality of the image. If you haven’t put much thought into cleaning up your listings, potential customers may end up at an old address or the wrong website. Old phone numbers, strange versions of your name, and incorrect street addresses can mislead your customers, so make any needed changes where you can. There are several tools from Moz or Yext to help you find accurate listings. Fix as many errors you can, and make sure to stay on top of it going forward. When there are duplicate listings, ranking strengths can be divided instead of being concentrated into a single listing. The best way to avoid this problem is to go through any directory and search for your business name to see if any duplicates come up. If any do, report them to be removed or merged. The sooner you get to reporting duplicates the better since it can take several weeks for a platform to resolve the issue. During the holiday season, many businesses will extend their hours to accommodate the higher volume of sales. Making hour changes on your website should be an easy edit, but having your listings reflect any holiday hours can be cumbersome for the majority of platforms. Luckily, My Google Business makes it a quick edit. Here you can read more about adding special hours through several different methods. Just remember to switch back to the regular hours after the holidays – the last thing you want is to have any potential customers showing up when your business is closed. Choose your best performing social media platforms to highlight any holiday sales, gift guides, or product pages, and maybe consider including a promo code for your dedicated social media followers. Make a spreadsheet with information for every post on every platform, curated down to the last image and character. 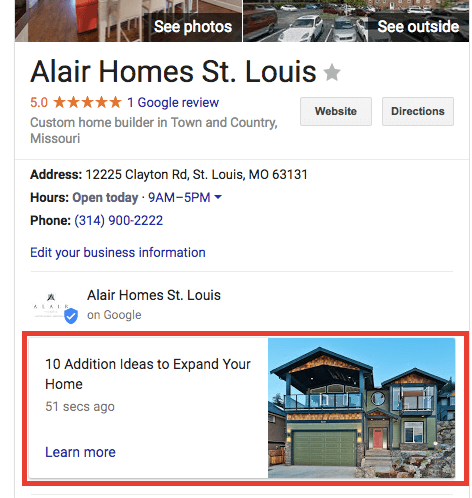 A great contender to use this time around is the new Google Posts, which show up in the Graphic Knowledge graph for your Business. Use a large 750×750 image with some short text, and the post itself will stay live for 7 days. ‘Tis the season for creating new holiday specific content, or to update pieces from the year prior. Try creating gift guides or other holiday-themed pages that inform your viewers while allowing you to show your latest products. Make sure the pieces are packed with high-quality images and optimized for your most important keywords. Each piece is a new opportunity to rank for a long-tail keyword phrase. Afterwards, consider creating a page that relays all your holiday-related content in one spot. It should be a given that you have Google Analytics setup, so the next step is to make sure you can track any leads or user engagement. One tracking method for the arsenal is using Goals. You can set up goals to track contact form submissions, newsletter signups, e-commerce purchases, phone calls, and more. If you want to know traffic details, you can also use UTM parameters for custom campaigns. When someone clicks on a certain URL that has UTM parameters, those tags are sent back to your Google Analytics for tracking. With UTM tags, you can track specific banner ads on your website, signatures in an email, downloads for an eBook, or a link from a Twitter post. As an SEO director, citations will forever be the lingering nuisance in my work repertoire.